To the highest peaks of the Czech and German part of the Ore Mountains, you can take chair lifts. You can even combine the two chair lift rides into one trip. Although each is in a different state, they are only a few kilometres apart and such a short distance can turn into a pleasant walk or ride on a bike when the weather is nice. 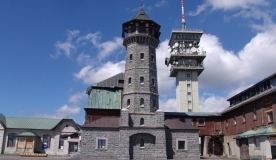 The bottom station is about 3 km from the centre of Jáchymov, in an altitude of 802 m. Free parking is available. The four-seat chair lift takes tourists to the top of Klínovec (1244 m) all year round and it takes about 15 minutes. From the top of Klínovec you can take walking tours, do downhill skiing and biking tours on several marked trails. Cyclists will appreciate the fact that they can take the bike on the chair lift for free. To the top of Fichtelberg (1214 m), you can take a cable car from 1924 (first in Germany) or four-seat chair lift. The capacity of one capsule is 44 persons. Both the cable car and the chair lift run in both directions, but from the top of Fichtelberg, as well as from Klínovec, you may like to enjoy a pleasant walk, a bike ride, or downhill skiing in winter. The cable car and the chair lift operate daily. Opening hours and prices vary depending on the season.